International Journal of Self-Propagating High-Temperature Synthesis has been accepted for a new edition of Web of Science (WoS) launching this fall. The new edition, called the Emerging Sources Citation Index, will make our content discoverable and citable in Web of Science. 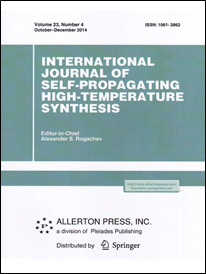 International Journal of Self-Propagating High-Temperature Synthesis включен для сканирования в новой публикации Web of Science (WoS), запускаемой этой осенью. Это издание, названное Emerging Sources Citation Index, сделает содержание нашего журнала видимым и доступным для цитирования всеми посетителями Web of Science.